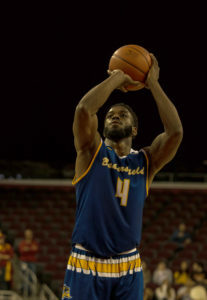 The CSU Bakersfield men’s basketball team is now one win away from heading to Madison Square Garden. 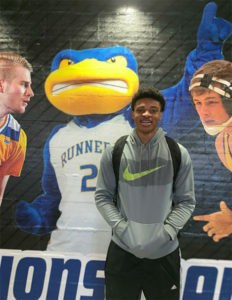 The eighth-seeded Roadrunners rolled past the fourth-seeded Colorado State University Rams 81-63 in the second round of the National Invitation Tournament. For the second consecutive game, the Roadrunners (24-9) were hot from three-point range in the first half. CSUB shot 10 of 13 from deep before the intermission. After CSUB jumped out to 13-2 lead, Colorado State (24-12) pulled within a point to trail 18-17 with 10:32 left in the first half. The Roadrunners went on a 34-15 flurry thanks to a three-point barrage to close out the half. CSUB led Colorado State 52-32 at the half. 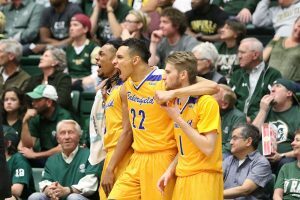 The CSUB bench celebrates during its second round victory over Colorado State University in Fort Collins, Colorado. Airington led the charge in the first half, scoring 14 of his team-high 19 points and dished out 3 assists. He also added 3 steals. The bench played a huge role in helping the Roadrunners extend the lead that they built. 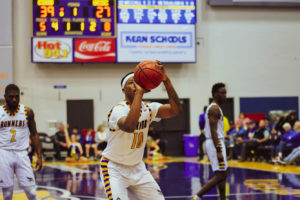 Junior forward Shon Briggs had a strong performance off the bench for the second consecutive game as he contributed with 15 points, 6 rebounds and 5 assists. Redshirt-sophomore guard Damiyne Durham added 12 points on 4 of 5 shooting from three-point range off the bench. Basile poured in 17 points and added 4 assists in the win. 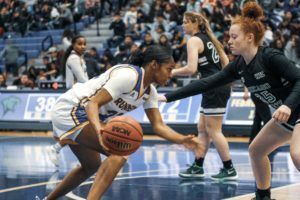 However, just like in the first-round win against California, CSUB got into foul trouble early. Redshirt-senior forward Matt Smith picked up two early fouls and was forced to sit. 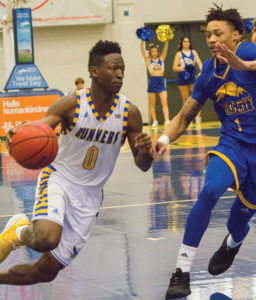 Junior forward James Suber filled in and scored his first points since Dec. 3. Suber finished with 2 points and 6 rebounds in 13 minutes off the bench. 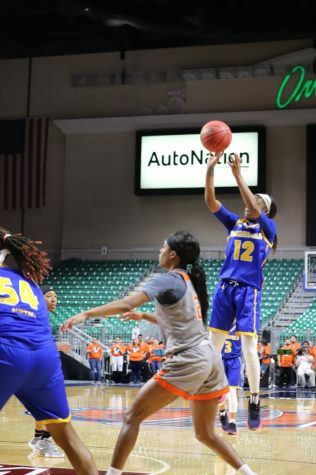 The Roadrunners were able to fend off any potential comeback attempts from the Rams by limiting them to only 23 percent shooting from three-point range. 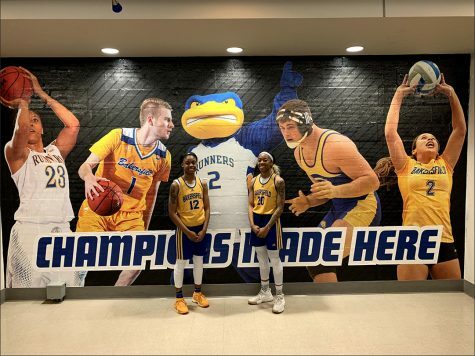 A triple with 9:43 remaining by Airington gave CSUB a 64-43 lead to put the game out of reach. Redshirt-junior guard and Boulder, Colorado native Brent Wrapp registered 8 points and 6 rebounds in a homecoming game. The Roadrunners will now head to Texas to take on University of Texas Arlington tomorrow at 6 p.m. on ESPNU in the NIT quarterfinals. The winner of this game will then move on to New York City for the NIT semifinals. 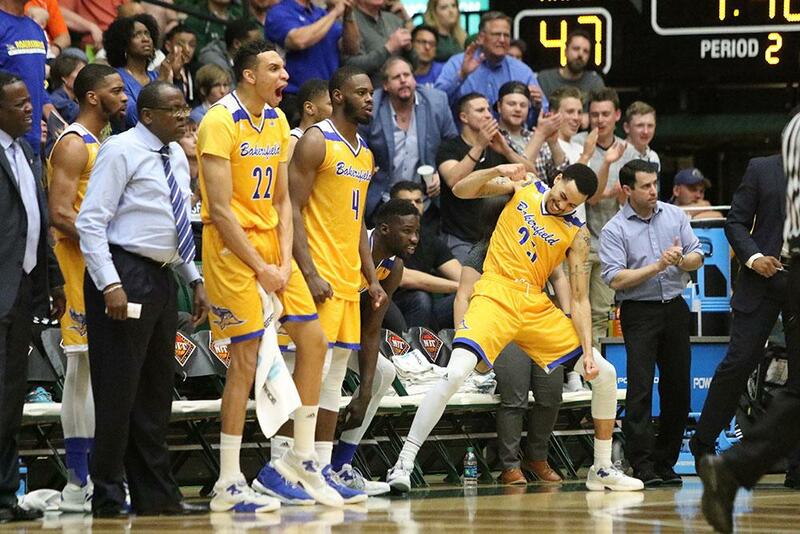 The CSUB bench celebrates during its second round victory over Colorado State University in Fort Collins, Colorado. 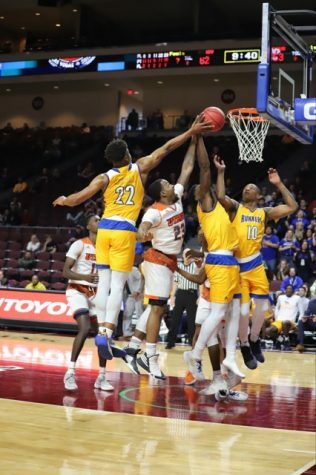 The Roadrunners will now face the University of Texas at Arlington in the National Invitation Tournament quarterfinals Wednesday, March 22.